Here is Ed using one of our wifi microscopes. 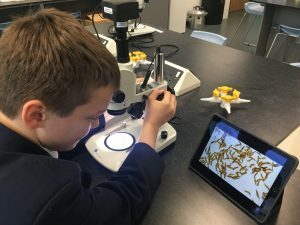 In preparation for our forthcoming shows (Bournemouth Orchid Show and the London Orchid Show) and to help our partner schools in Rwanda and Sarawak, students are preparing information about orchid seed. This is seed of Dendrobium thyrsiflorum photographed by Ed. 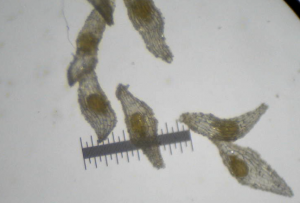 By using a 1mm scale on our microscope slide we can also measure the seeds which are very variable in size shape and colour. This Cymbidium hookerianum seed is quite large (1.0mm long) and clearly shows the characteristic orchid seed with an embryo inside a dry seed coat. 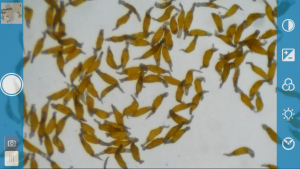 Unlike most plant seeds there is no food supply for the germinating embryo and so it needs an external food source – mycorrhizal fungi in the wild and growing media in our lab. 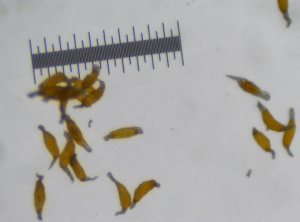 As you can see, the Dendrobium thyrsiflorum seed is much smaller (about 0.3mm long) but the embryos are not much smaller than the cymbidium embryos as they fill their seed coats. We will have a full range of seed for you by the end of the week. Would anyone be interested in a 2020 Orchid Seed Calendar? it is lovely to find such beauty in tiny things we can’t usually appreciate. Yes definitely. What a fantastic idea!